Garter encircled shield of arms of Archibald Primrose, 5th Earl of Rosebery, KG, as displayed on his Order of the Garter stall plate in St. George's Chapel, viz. Quarterly, 1st and 4th, vert three primroses within a double tressure flory counterflory or, for PRIMROSE; 2nd and 3rd, argent a lion rampant double-queued sable, for CRESSY. Dalmeny attended preparatory schools in Hertfordshire and Brighton and then Eton which he attended between 1860 and 1863; he then went to Brighton College between 1863 and 1865. His remarkable intellect, displayed in debates, attracted the attention of William Johnson Cory. Dalmeny proceeded to Christ Church, Oxford, through the years 1865 until 1869. Remarkably the three Prime Ministers from 1880 to 1902, namely Gladstone, Salisbury and Rosebery, all attended both Eton and Christ Church. Whilst at Christ Church, in 1868 Dalmeny bought a horse named Ladas, although a rule banned undergraduates from owning horses. When he was found out, he was offered a choice: to sell the horse or to give up his studies. He chose the latter, and subsequently was a prominent figure in British horseracing for 40 years. Rosebery's government was largely unsuccessful, as in the Armenian crisis of 1895–96. He spoke out for a strongly pro-Armenian and anti-Turkish policy. Gladstone, a prime minister in retirement, called on Britain to intervene alone. The added pressure weakened Rosebery. His estate was probated at £1,500,122 3s. 6d. ; (equivalent to £89,573,000 in 2018) and he was thus the richest prime minister ever, followed by Salisbury, then by Palmerston. It was also speculated that Rosebery was homosexual or bisexual. Like Oscar Wilde, he was hounded by John Douglas, 9th Marquess of Queensberry, for his association with Francis Douglas, Viscount Drumlanrig, one of Queensberry's sons — who was his private secretary. On 18 October 1894, sixteen months after his ennoblement, Drumlanrig died from injuries received during a shooting party. The inquest returned a verdict of "accidental death", but his death was rumoured potentially to be suicide or murder. It was speculated at the time, and indeed evidence suggests, that Drumlanrig may have had a romantic or sexual relationship with Rosebery. 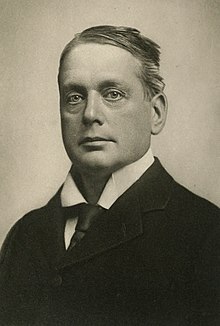 The suggestion was that Queensberry had threatened to expose the Prime Minister if his government did not vigorously prosecute Wilde for Wilde's relationship with Drumlanrig's younger brother, Lord Alfred Douglas. Queensberry believed, as he put it in a letter, that "Snob Queers like Rosebery" had corrupted his sons, and he held Rosebery indirectly responsible for Drumlanrig's death. Albert Edward Harry Meyer Archibald Primrose, 6th Earl of Rosebery known as Harry (8 January 1882 – 30 May 1974) he married Lady Dorothy Grosvenor (granddaughter of Hugh Lupus Grosvenor, 1st Duke of Westminster through his third son Lord Henry Grosvenor) on 15 April 1909 and was divorced from her in 1919. They had two children. He married Hon. Eva Isabel Bruce (daughter of Henry Campbell Bruce, 2nd Baron Aberdare) on 24 June 1924. They had two children. Neil James Archibald Primrose (14 December 1882 – 18 November 1917) he married Lady Victoria Stanley (daughter Edward Stanley, 17th Earl of Derby) on 7 April 1915. They had one daughter: Ruth Wood, Countess of Halifax. Lady Sybil Primrose (1879–25 February 1955) she married General Sir Charles Grant on 28 March 1903. They had one son. Lady Margaret "Peggy" , Etrenne Hannah Primrose (1881–13 March 1967) she married Robert Crewe-Milnes, 1st Marquess of Crewe on 20 April 1899. They had two children. ^ Lawrence, Jon (2009). Electing Our Masters : The Hustings in British Politics from Hogarth to Blair. Oxford UP. p. 1. ISBN 9780191567766. ^ Martel, Gordon (1986). Imperial Diplomacy: Rosebery and the Failure of Foreign Policy. McGill-Queen's UP. ISBN 9780773504424. ^ James, Robert Rhodes (1963). Rosebery (Paperback 1995 ed.). London: Weidenfeld and Nicolson. p. 9. ISBN 978-1857992199. ^ Footprints in Time. John Colville. 1976. Chapter 2, Lord Roseberys lamb. ^ "Papers Past — Observer — 5 May 1894 — CAP AND JACKET". Paperspast.natlib.govt.nz. Retrieved 2016-04-01. ^ Robert Kelley, "Midlothian: A Study In Politics and Ideas," Victorian Studies (1960) 4#2, pp. 119–40. ^ Turcotte, Bobbi (26 August 1982). "Former English PM's name, title still in use". Ottawa Citizen: 2. Retrieved 30 May 2016. But Primrose Avenue is named after Archibald Philip Primrose, fifth Earl of Roserbery (1847–1929), who was primse minister of England in 1894–95. ^ "Congress Presidents 1869–2002" (PDF). February 2002. Archived from the original (PDF) on 28 May 2008. Retrieved 10 May 2008. ^ McKinstry, Leo (2006). Rosebery – Statesman in turmoil (Paperback ed.). Great Britain: John Murray. pp. 265–6. ISBN 978-0719565861. ^ Haniamp, M. Sukru (1995). The Young Turks in Opposition. Oxford UP. pp. 61–62. ISBN 9780195358025. ^ Gordon Martel (1986). Imperial Diplomacy: Rosebery and the Failure of Foreign Policy. McGill-Queen's UP. ISBN 9780773504424. ^ Élie Halévy, Imperialism and the Rise of Labour, 1895–1905 (1951) pp 99–110. ^ John S. Galbraith, "The pamphlet campaign on the Boer war." Journal of Modern History (1952): 111–126. ^ Wilson, John (1973). CB – A life of Sir Henry Campbell-Bannerman (1st ed.). London: Constable and Company Limited. pp. 301–2. ISBN 978-0094589506. ^ Jenkins, Roy (1964). Asquith (1994 paperback ed.). London: Pan Macmillan Publishers Limited. p. 130. ISBN 978-0333618196. ^ R. R. James, Rosebery: a biography of Archibald Philip, fifth earl of Rosebery (1963), p. 469. ^ R. O. A. Crewe-Milnes, Lord Rosebery, (1931), vol. 2. p. 51. ^ Rhodes James, p. 485. ^ Lord Rosebery to marry a Princess?, New York Times, 11 July 1901. ^ The Complete Peerage, Volume XIII – Peerage Creations 1901–1938. St Catherine's Press. 1949. p. 187. ^ Englefield, Dermot; Seaton, Janet; White, Isobel: Facts about the British prime ministers. A compilation of biographical and historical information. London: Mansell, 1995. ^ "National Burns Collection - Burns Statue, Dumfries with Tam O'Shanter…". ^ Venn and Venn, "Primrose, Archibald John (Lord Dalmeny)", Alumni Cantabrigenses ; she was the first wife; Archibald Primrose, Lord Dalmeny, was born in 1809, during this marriage (see Venn and Venn, "Dalmeny, Lord Archibald", Alumni Cantabrigenses). ^ W.P. Courtney, "Stanhope, Charles", Dictionary of National Biography, vol. 54. ^ Cokayne, Complete Peerage, vol. 6, 1895, p. 415 ; she was sister of the fourth Duke of Argyll and daughter of Hon. John Campbell and Elizabeth, daughter of John Elphinstone, eighth Lord Elphinstone. ^ Cokayne, Complete Peerage, vol. 6, 1895, p. 415 ; she was the daughter of Lt-Gen. Thomas Howard. ^ S. Farrell, "Bouverie, Hon. Bartholomew (1753–1835), of 21 Edward Street, Portman Square, Mdx. ", History of Parliament: the House of Commons 1820–1832 ; she was the daughter of John Alleyne of Four Hills, Barbados. ^ Cokayne, Complete Peerage, vol. 6, 1895, p. 416 ; Lodge, British Peerage, 1832, p. 24 ; he was the third son of Henry Arundell, sixth Lord Arundell. ^ Lodge, British Peerage, 1832, p. 24 ; she was the daughter of John Wyndham of Ashcombe, Wiltshire. ^ W.P. Courtney, "Stanhope, Charles", Dictionary of National Biography, vol. 54 ; she was a daughter of Charles Hamilton, Lord Binning, and sister to Thomas Hamilton, seventh Earl of Haddington. ^ W.P. Courtney, "Stanhope, Charles", Dictionary of National Biography, vol. 54 ; he was a younger brother of the Earl Temple. ^ Burke and Burke, A Genealogical and Heraldic History of the Extinct and Dormant Baronetcies, 1841, pp. 34–35 ; M.M. Drummond, "Grenville, Henry (1717–84), of Shrub Hill, Dorking, Surr. ", The History of Parliament: the House of Commons 1754–1790, ed. L. Namier, J. Brooke., 1964 ; Daughter of Sir Joseph Banks of Revesby Abbey, Lincolnshire. ^ A.F. Pollard, "Smith, Robert (1752–1838)", Dictionary of National Biography, vol. 53 ; daughter of Thomas Bird of Barton, Warwickshire. ^ Cokayne and Gibbs, Complete Peerage, 2nd ed., vol. 3, 1913, p. 63 ; of Cave Castle, Yorkshire. ^ Cokayne and Gibbs, Complete Peerage, 2nd ed., vol. 3, 1913, p. 63 ; she was the daughter of William Popplewell of Monk Hill, near Pontefract. Chisholm, Hugh, ed. (1911). "Rosebery, Archibald Philip Primrose, 5th Earl of" . Encyclopædia Britannica (11th ed.). Cambridge University Press. "Archival material relating to Archibald Primrose, 5th Earl of Rosebery". UK National Archives.